SHORT VERSION: I was concerned when I saw a medium honey super suddenly crowded with bees. It turns that’s nothing to worry about. That’s a view of the bees through a screen at the bottom of an empty moisture quilt, essentially a screened inner cover and ventilation rim. Anyway, the bees are crowded up over the top bars in the honey super, pushing themselves into the screen of the empty moisture quilt. That’s a full blown cluster of bees, not just a few hundred workers showing interest in a honey super. My guess — my hope — is that several frames of brood emerged over the past couple days and they’ve been stuck in the hive because of the bad weather — and they had nowhere to go but up. I really hope that’s all it is. I plan to add another deep to the hive tomorrow to make room for all the new bees and give the queen more laying space. What I hope it isn’t is the colony getting ready to swarm. I haven’t been able to do a full inspection in about three weeks because the weather has been so cold and damp. Swarm cells could have easily developed in those three weeks, and with this weird weather, it wouldn’t surprise me if the swarming season got pushed back into August. If so, all those bees up there could be bees gorging themselves on honey in preparation for swarming. So tomorrow when I add another deep to the hive, I’ll check for swarms cells too. My first thought seems to have been correct. A few thousand baby bees looking for their first foray into the world couldn’t get outside because it was cold and wet, so they went up into the honey super instead, or some other bees got out of their way and went up. I observed many orientation flights that next morning. I added a third deep to hive and pulled up some brood, but I’ll post photos of that whole procedure later. I’ll relax if I see the bees suddenly crowding into a honey super again. Now I know. Experience means everything. 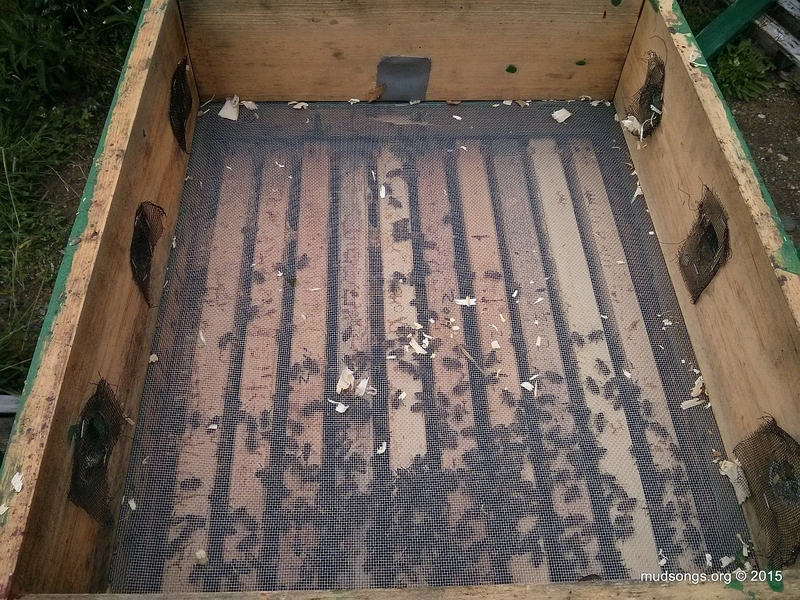 This entry was posted in Month of August, Swarm Prevention, Swarm Risk, Year 2015. Bookmark the permalink. 9:00am the next morning. I just checked on the bees. Most of them are gone from the honey super and I see lots of orientation flights happening. It seems my first thought was correct. 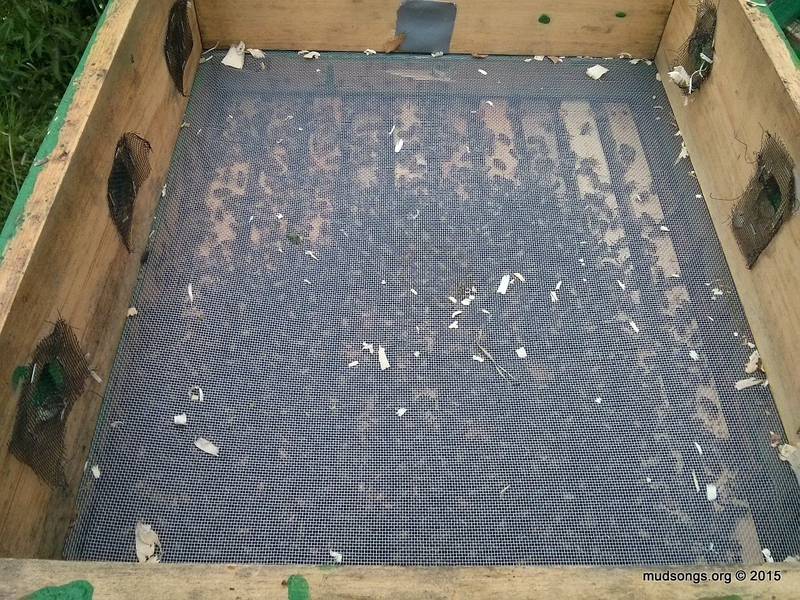 The view in the first photo is more familiar to me, but my bees tend to do far more burr comb along the top of the supers and really pack every gap possible in with wax and honey, so that lifting the frames out is difficult. Yours almost look like they’re sitting on top of empty frames – must be the weather difference. The frames had drawn comb and some honey in them, but are essentially empty drawn comb. The bees ate up the honey but haven’t made any honey in the honey super yet. I would normally have this many bees in the hive by end of May, not the end of August. It’s been a slow build up for this colony. I plan to remove the medium honey super altogether and do what I can to get as much as much brood from this hive.